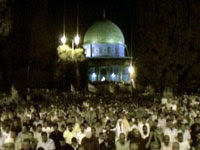 Tens of thousands of Muslim worshippers pray in Jerusalem to mark Laylat al Qadr, the 27th night of Ramadan. Tens of thousands of Muslims gathered at Jerusalem's al-Aqsa mosque to celebrate 'Laylat al Qadr', holding prayers overnight from Friday and into Saturday (August 27). The worshippers crowded the court near the mosque in the heart of the Old City of Jerusalem, home to the third holiest shrine to Muslims and Judaism's holiest site. Laylat al Qadr commemorates the night that the prophet Mohammed is believed to have received the first verses of the Koran. Its exact timing is unknown, but it is believed to have most likely fallen on the 27th night of the Muslim month of Ramadan according to most Sunni Muslim historians. The al-Aqsa mosque is holy to Muslims due to the belief that this is where Prophet Mohammed ascended to heaven. Ramadan is the ninth month of the Islamic calendar, when the Koran was revealed to the Prophet Mohammed. During that month, Muslims fast from sunrise to sunset.